Park Seo Joon and Kang Ha Neul were the cherries on top! Trainees by day, detectives by night. Ki Joon (Park Seo Joon) and Hee Yeol (Kang Ha Neul) meet as new students in a Korean Police University. The former was signed up for the free tuition, while the latter joined to be different from the geeks like him. Their intentions weren't noble at first, and they definitely didn't have their heart set on being cops, however, as they go through training, both of them discover that they're naturals for the job. They weren't friends in the beginning, either. They were very much different from each other, so Ki Joon didn't really understand Hee Yeol nor cared for him, and Ki Joon got on Hee Yeol's nerves. But after a test of compassion and camaraderie, they instantly bond and become solid bros.
One night, they decide to go out and unwind, but at the end of the evening, they witness a kidnapping. They report the case and urge the local police force to take action, but the incident wasn't a priority for the cops. With the tough Joo Hee (Park Ha Sun) and the veteran Professor Yang (Sung Dong Il) as mentors, they conduct their own (amateur) investigation and get into all sorts of trouble. 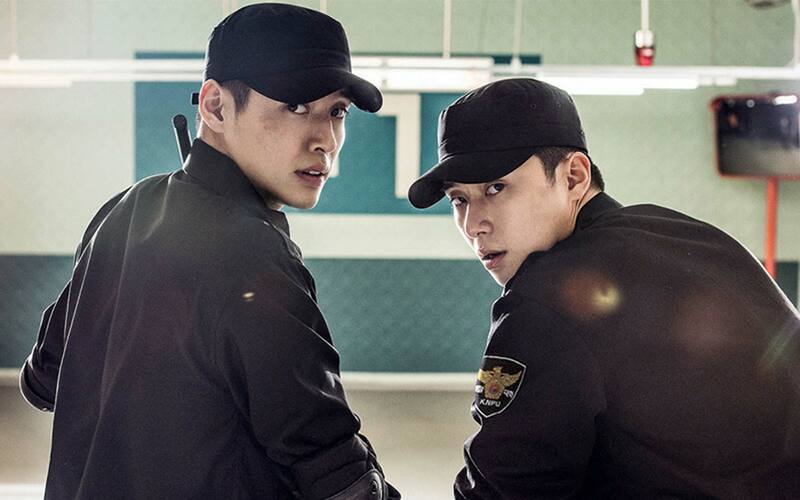 Two young and energetic policeman hopefuls who are polar opposites become friends because of their innate compassion in helping others. They're not the best in school and even defy a bunch of rules, but they shine where it matters and when it's needed most—even if they end up putting themselves in danger in the process. The last time he made you teary-eyed (or uncontrollably sob) was when he played Ko Dong Man, the inspiring (and very funny) lead in Fight for My Way (2017). The last time she played a mentor (like in the movie) was in a drama series entitled Drinking Solo (2016). She was also in the series Temptation (2014) with Choi Ji Woo, Kwon Sang Woo, and Lee Jung Jin. The most recent drama series he was in were Hwarang (2016) with Park Seo Joon and Scarlet Heart: Ryeo (2016) with Kang Ha Neul. As you may know, he also starred in several other movies and series as a teacher, mentor, general, father, and similar authoritative figures. The movie was released in Korea on August 9, and it attracted millions of viewers (more than 5.6 million was the estimated box office admissions). It grossed more than 39 USD—among the highest-grossing films in 2017 so far. That's not including its stats in the countries the movie's screening rights were sold to. It's the first time for Park Seo Joon to play the lead in a movie—and the golden boy won two Best New Actor awards for his role. Meanwhile, Midnight Runners also landed a spot in the top 10 films awarded by the Korean Association of Film Critics. One controversial part of the movie depicted Daerim in Seoul, home to Korean Chinese people, as a hub of gangsters that even policemen don't dare cross. The negative connotation angered activists in the minority group, who protested and demanded the suspension of the movie on top of an apology.The production company behind the hit movie did issue a statement apologizing for the controversy and stating that that part of the story was fictional. As you can gather from my fiancé’s comments, it's the perfect date movie if bae loves action-comedy films or those funny buddy cop thrillers like Rush Hour and 22 Jump Street. But, okay, TBH, if you adore PSJ and KHN, you may not be able to resist smiling like an idiot and gawking at their cuteness. Better prepare bae (and your heart) for that. Anyway, with the gripping cinematography and storytelling, you will definitely be on the edge of your seats. The fighting scenes were so impressively staged that you'll feel like the pain the characters felt were real. Fair warning: A few themes in the movie might just be uncomfortable for some people, such as the bloody beatings in some parts and the crimes like human trafficking. When it comes to the actors, I was so impressed with KHN's acting. Like his (darned, blasted, annoyed-and-still-not-over-it) role in Scarlet Heart: Ryeo, his portrayal of Hee Yeol was so far from his very cheerful and ~*kyeopta*~ personality in variety shows, interviews, and his social media posts. He was mysterious and even stoical, which really balanced PSJ's stormy character in the story. But PSJ, as usual, was totally entertaining! You can really see how professional he is as an actor with his ability to make you root for him, especially when he's caught in a dilemma that tests his conscience and courage. I can't wait to see more of him in dramas and movies. Anyone who wants a breather from cheesy rom-coms and any girl who'd want to spark their guy's interest in Korean films—aside from fans of PSJ and KHN, of course! Midnight Runners is now showing! Catch it in cinemas nationwide.